Amy Carroll is a coach, trainer, speaker and recovering predator based in Vevey, Switzerland. She first discovered the mishaps of communication at an early age when she began challenging the misbehavior of those in power. After investing many years learning the ineffective ways of communicating, Amy set off on a path of self-discovery and eventual mastery. She spent 14 years working in psychiatric and educational facilities. Having received both designation of PCC Professional Certified Coach from the International Coach Federation and Certified Master Practitioner of NLP Neuro linguistic programming, Amy leads programs on influencing, leadership and emotional intelligence, as well as advanced presentation techniques, to managers, executives and teams at multinationals worldwide. Amy is an energetic, engaging presenter. She shows her clients how to be dynamic, honest and effective communicators while developing their ability to influence others by creating powerful partnerships. “Make Your Partner Look Good” is her motto. Client list includes corporations Alcon, A.P. Moller-Maersk, Baxter, Baxalta, Dow, Dupont, Ernst & Young, European Stability Mechanism, Ferring, HEC Lausanne, HP, HPE, Merck Serono, Medtronic, Microsoft, Medicines For Malaria, Nestlé, Nespresso, Novartis, Parker, P&G, Saatchi & Saatchi, Shire, Swiss Post, UBS, United Nations, Varian and World Economic Forum. 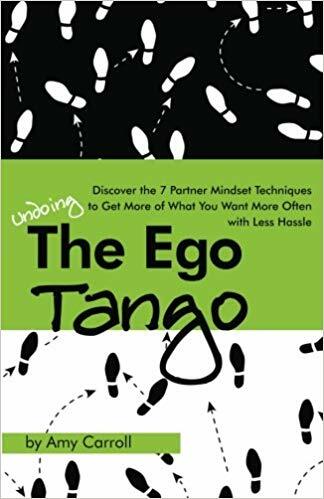 Amy’s book, The Ego Tango, is a portable coach and reveals how to apply the 7 Partner Mindset Techniques to show you How To Get More of What You Want More Often With Less Hassle.